The University Center covers nearly 30 percent of all of its energy needs. The exterior of the new University Center encompassing the 14th street block of Fifth Avenue is certainly impressive (or “gorgeous,” according to one of the tenants of its residence hall), but perhaps even more so is the fact that this example of “smart” design apportions resources sustainably and dynamically. Our University Center is something of an Einstein of buildings. From the concrete used in the foundations (composed in part of materials reused from coal manufacturing) to the window design (placed at heights to capture natural light bouncing off interior walls) to the green roof garden (funded in part by a grant from the NYC Department of Environmental Protection) that provides insulation and traps storm water, the new anchor for The New School is a pioneer in sustainability. One way in which the new building sets a trend is its low impact on the city’s electrical grid, which is managed by Con Edison. “There’s only so much capacity the grid can handle in a city like Manhattan,” said Whalen. “Going forward, construction efforts will have to be conscious of that.” The University Center incorporates two major systems on this front. An ice storage unit in the lower level helps to keep the building cool in the summer months, especially during excessive heat when the city’s system is most burdened. Whalen estimates that only four or five buildings in the metro area have similar systems. 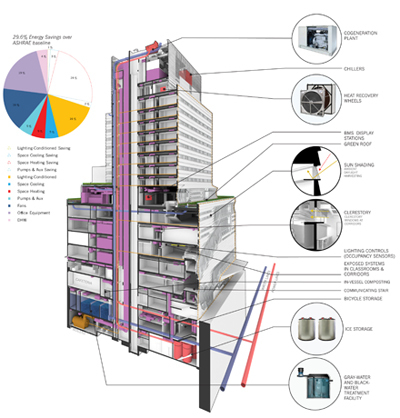 The second system, microturbines situated on the 17th floor, produce as much as 30 percent of the entire building’s electricity needs, further reducing impact on the city’s grid. Whereas both of these structures will be relatively unnoticed by occupants, other smart features are incorporated into the decor itself. Most apparent is the sweeping staircase, which Mayor Michael Bloomberg praised earlier this summer. “Instead of using the elevators, your first inclination is to take the stairs,” said Whalen, “it’s the easiest way to get to where you’re going.” Beyond encouraging healthful activity and decreasing energy consumption, the stairs also provide space for students, faculty, and guests to meet, mingle, and share ideas. Fostering this social collaboration and exploration is also one of the core designs of the University Center. This fall, Collab: University Center, a course offered by Parsons Design and Technology professor Leif Percifield, will have students consider the way human behavior affects the sustainability of the indoor environment and offer alternatives for incorporating better practices and systems. To learn more about sustainability features in the University Center, visit the website. Stay tuned for more features on the new focal point of The New School.